This post was originally published just for our supporters, but now it’s available to everyone. Thanks for reading! There are, in my opinion, several factors contributing to people’s dissatisfaction with gearing up in Battle for Azeroth. Before I go into terrific detail, I should express the following — it’s actually fairly easy to get decent gear this expansion. I’ve geared two characters up to above 340 and a third to 330 and it really didn’t take too much time to get it done. The problem is in the interaction between various changes between Legion and Battle for Azeroth. The first is that we, as players, are having a very hard time getting acclimated to the return of weapon drops. To a certain degree this was to be expected, but the very random nature of loot acquisition means that you can end up using the same weapon well after you’ve replaced every other piece of gear — and with weapon DPS being such an important part of overall DPS for many classes it can feel utterly awful. 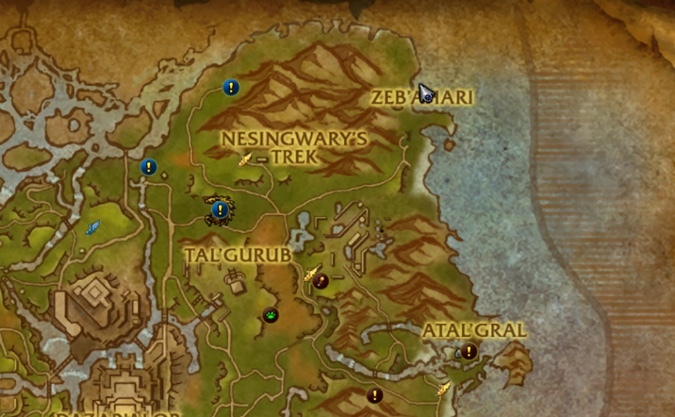 This is exacerbated by some classes/specs feeling as if they simply aren’t getting any drops — Assassination Rogues desperately searching for a dagger, for example, when there aren’t any on the World Quests, or a Fury Warrior constantly getting 1h weapons they can’t use because Single Minded Fury was removed in Legion. This is a consequence of the loss of the Artifacts but also of the strict rules applied in Legion as to what weapons specific specs could and/or couldn’t use. Frost Death Knight’s seeing their attacks tied to 1H weapons, for example, means that Blizzard doesn’t have to balance their abilities to be roughly equal for both DW Frost and 2H Frost, since 2H Frost no longer exists. 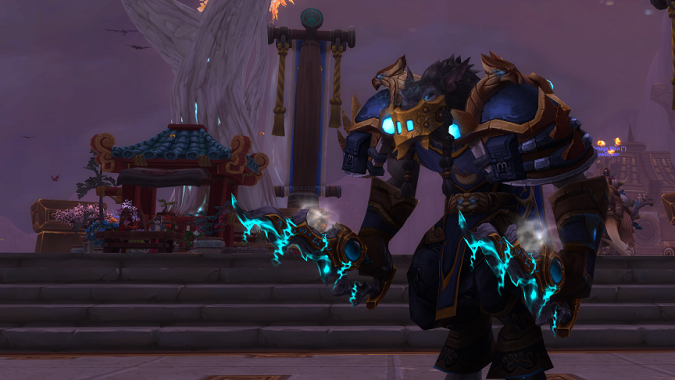 But it also means that when my DK got several 2H weapons in a row, none of them were any use for his Frost offspec. This tightening up of weapon requirements has combined with the need to keep weapons current and the paucity of weapon World Quests (and how they can be giving you weapons you can’t really use, like when I get an emissary with a 1H fist weapon drop and my Fury Warrior sighs and loads it in the scrapper) has led to some dissatisfaction with the system. The next problem is itemization. Quite frankly, this one I blame on the change to the global cooldown and what abilities are on it that was aimed at preventing so many chained cooldowns and extremely high burst that we saw in Legion, because just looking over a few classes stat priorities (I chose Assassination Rogue, Havoc Demon Hunter, Arms Warrior, Frost Mage and Destruction Warlock) Haste has become one of the most desirable stats, either in first or second place for all of them. There’s some variety after that, but Versatility is still seen by most classes as a stat at or near the bottom. This isn’t universal — Havoc Demon Hunters like Versatility quite a bit, for example. But even after Arms was changed to rely more heavily on Deep Wounds we’re still advised that Haste and Critical Strike are our best stats, and that Mastery and Versatility are significantly less valuable. Combine this with the fact that secondary stats increase more slowly with item level in Battle for Azeroth and we keep seeing players saying things like I got a 370 ring but it’s Mastery and Versatility so I had to keep my 345 ring with Haste and Crit because the higher ilevel item, supposedly an upgrade, will actually hurt their DPS or healing. When certain stats just aren’t competitive and we’re getting less of an increase on secondary stats this time around, those less desirable stats feel even more undesirable and we feel forced to stay with lower ilevel gear because it has the stats we want. Haste’s value as a secondary stat is inflated by its influence on the GCD — players who want their rotation to compress and which generate primary resources by abilities or attacks want as much haste as they can get their hands on to keep from having gaps in their rotation. This is also exacerbated by sockets on gear. Sockets can be maddening because, when a piece drops with a socket, its item level does not increase so if you’re trying to hit an ilevel cap to run content — such as a 305 for Heroic dungeons or 320 for Warfronts and LFR — a piece of gear with a socket just isn’t as valuable. But once you have that socket, since you can put a +40 Versatility or Mastery or Haste or Crit gem in that piece, it’s now more valuable than a higher ilevel piece that might have the same stats, but which you can’t get an extra bump of stats from the gem in the socket. Yes, that 355 ring is nice, but it has the same stats as my 340 ring, and that has a socket. 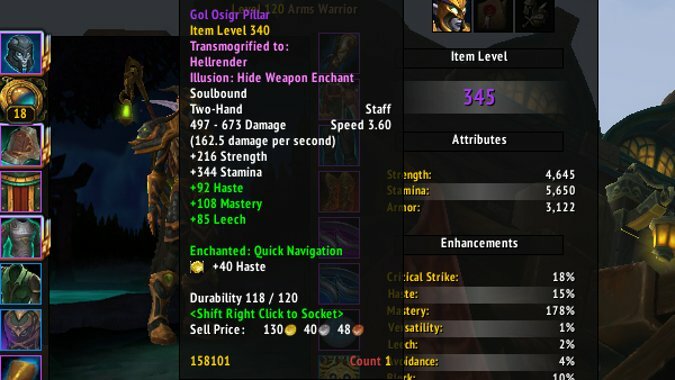 Just this morning I got a 360 ring from my Mythic chest that had Mastery and Versatility on it. I couldn’t dump my socketed Haste/Mastery ring even though it’s a 20 ilevel increase, I’d have lost too much Haste. These all combine to create negative feedback in the gear acquisition process. The combined effects of not getting the drops you need, getting drops that aren’t upgrades in reality even though they are of a higher ilevel, and having to weigh stats and Azerite traits via the very complex Azerite Armor system all create tension. Another issue is a well-intentioned one: under the current Personal Loot system, players can’t trade a piece of gear if it’s an ilevel upgrade over what they’re currently using. But if an Assassination Rogue gets a sword drop in a raid, she can’t use it with the restrictions on Assassination abilities, nor can she trade it to the Demon Hunter who could use it if the sword is an ilevel increase over her current daggers. A Demon Hunter similarly can’t get those Versatility pants the Rogue doesn’t want for the same reason. Imagine logging on and finding out that the Emissary quest for that day rewards a weapon… that you can’t use in your current spec. Then you check your Mythic+ chest… and get a ring that’s 10 or more ilevels better, but which would cost you too much of your secondary stat priority to use. Then you go and fight the World Boss… and he drops an upgrade that you can’t equip without losing a socket and which you can’t even trade to another player because they’re a higher ilevel than your current pants. This all happened to me today. How can we fix this? To a degree, patch 8.1 will help, with more content coming including two new raids and a new Warfront to help players get more shots at gear. But that just deals with scarcity. One thing to consider is that perhaps we’ve gone too far down the path of complexity in gearing. Back when we had Reforging, if you got a piece of gear with undesirable stats, you’d reforge to stats you wanted. This was seen as bad because it meant people ended up needing to use outside sites like Ask Mr. Robot to figure out their optimal reforges, and I can attest that it got very, very complicated after a while. 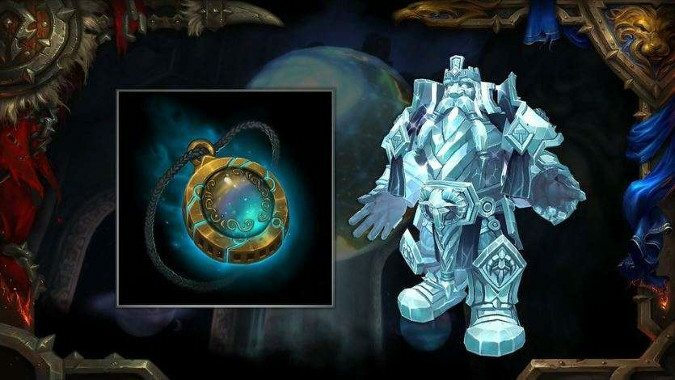 But now, with Azerite traits, sockets and secondary stats being valued differently across different classes, we’re rapidly approaching a renaissance of needing an outside source to help you maximize your gear. Only now, you can’t adjust the gear so much as just hoping the pieces you need drop. Am I saying bring reforging back? No. I’m saying go back to the design philosophy that an upgrade should always be an upgrade. Don’t make sockets a random chance to happen and don’t cut them out of the ilevel calculation on gear, so that a 340 piece with a socket trumps a 355 piece without one — instead of sockets being a boost to how good a piece is, they should be a boost in terms of how customized you can make it. A 355 or 370 piece should always be more exciting to you than a 335 or 340 piece. Also, I think it’s time to consider getting rid of Versatility. It was a nice experiment, but keeping track of four secondary stats is rough, and having a stat that varies so wildly in terms of it being good or not (to the point that some specs love it, some hate it, and a few hate it or love it based on what kind of fight we’re talking about) just makes it a complete wild card in terms of items being actually worth using. After we got rid of reforging, Warlords made gearing simpler by making some pieces switch between stats — a cloak could go between Agi and Str so all tanks could use it, for example, some gear went between Agi and Int or Int and Str so it could switch between melee or casting or healing, things like that. 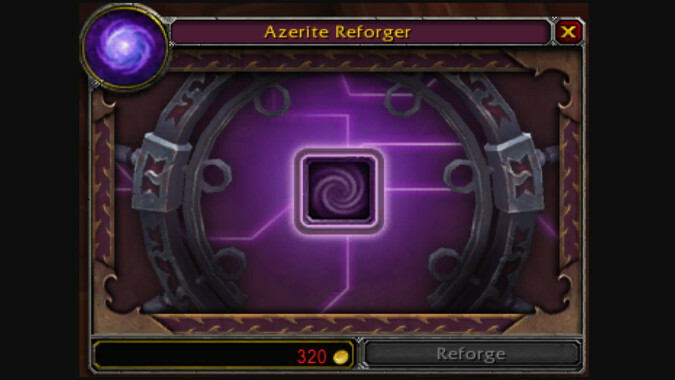 With Azerite gear and the way secondary stats work we’ve inched right back up on complexity, and now that we’ve gotten the item squish for Battle for Azeroth done with, I think we need to revisit the idea of just how many secondary stats, traits and other moving parts the gearing system requires. Choices that aren’t meaningful don’t feel good. Fewer options might actually make the system better and more reliable right now. Relax weapon restrictions so that certain classes can use more weapons, reduce stat bloat so there isn’t as much chance for an item to have your worst stat on it, and make sockets something people don’t feel they have to hold onto no matter what, and a lot of players will feel less constrained by their specs.